The Yamasaki TP01 Fiber Optic Power Meter is the latest self-developed multi-functional fiber optic power meter designed for the installation, construction and maintenance of fibre optic networks. 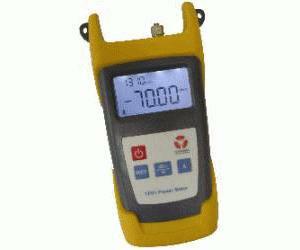 The Yamasaki TP01 Fiber Optic Power Meter features a rugged outer housing, optional backlight, auto shut off function, wide measurement range, accurate test, self-calibration and universal connector. The stability and reliability are greatly enhanced due to the implementation of the large square 1.0mm InGaAs detector. Ideal for use in fiber optic telecommunications and data networks, It is capable of accurately measuring power in wavelengths of 850, 1300, 1310, 1490, 1550 & 1625nm. Recommended for use with the Yamasaki TL01 Light Source.